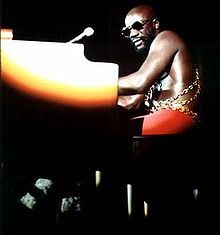 Isaac Lee Hayes, Jr. (August 20, 1942 – August 10, 2008) was an American singer-songwriter, actor and musician. Hayes was one of the main creative forces behind southern soul music label Stax Records, where he served as both an in-house songwriter and producer with partner David Porter during the mid-1960s. Alongside, Bill Withers, the Sherman Brothers, Steve Cropper and John Fogerty, Hayes & Porter were named to the Songwriters Hall of Fame in 2005 in recognition of their string of successful hit songs for Sam & Dave, Carla Thomas and others In the late 1960s. Their hit song "Soul Man" by Sam & Dave has been recognized as one of the best or most influential songs of the past 50 years by the Grammy Hall of Fame, The Rock and Roll Hall of Fame, Rolling Stone magazine, and the RIAA Songs of the Century. In the late 1960s, Hayes became a recording artist, and recorded successful soul albums such as Hot Buttered Soul (1969) and Black Moses (1971) as the Stax label's premier artist. In addition to his work in popular music, Hayes was a film score composer for motion pictures. His best known work, for the 1971 blaxploitation film Shaft, earned Hayes an Academy Award for Best Original Song (the first Academy Award received by an African-American in a non-acting category) and two Grammy Awards. He received a third Grammy for the album Black Moses. In 1992, in recognition of his humanitarian work, he was crowned an honorary king of Ghana's Ada district. 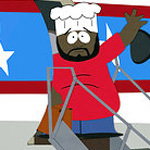 Hayes also acted in motion pictures and television; from 1997 to 2005, he provided the voice for the character "Chef" on the Comedy Central animated TV series South Park, and Gandolf "Gandy" Fitch on The Rockford Files (which ran on NBC from 1974-1980). On March 20, 2006, Roger Friedman of Fox News reported that Hayes had suffered a minor stroke in January. Hayes's spokeswoman Amy Harnell denied that Hayes had a stroke, but on October 26, 2006 Hayes himself confirmed that he had suffered a stroke. Two years later, Hayes was found unconscious in his home located just east of Memphis on August 10, 2008 as reported by the Shelby County, Tennessee Sheriff's Department. A Shelby County Sheriff's deputy and an ambulance from Rural Metro responded to his home after his wife found him on the floor near a still-running treadmill. Hayes was taken to Baptist Memorial Hospital in Memphis, where he was pronounced dead at 2:08pm. Hayes was ten days from his 66th birthday. The cause of death was not immediately clear, though the area medical examiners later listed a recurrence of stroke as the cause of death. Hayes is buried in the Memorial Park Cemetery in Memphis, Tennessee, next to friend and fellow Soul musician, Rufus Thomas.